Like For The Pun Of It? Click here to view the entire range. Avoid stains and keep spillage to a minimum with this comical coaster, part of the ‘For the Pun of it’ collection. This coaster displays a fun and happy cartoon illustration accompanied by a silly pun. Brighten up your desk, study or dinner table with this vibrant coaster and have a little giggle every time you take a sip! This coaster is made from wood and on the base has four pads in each corner, ensuring your surfaces won’t be scratched or damaged. The background is yellow with an illustration of two animated pieces of bread with arms, legs and happy faces. 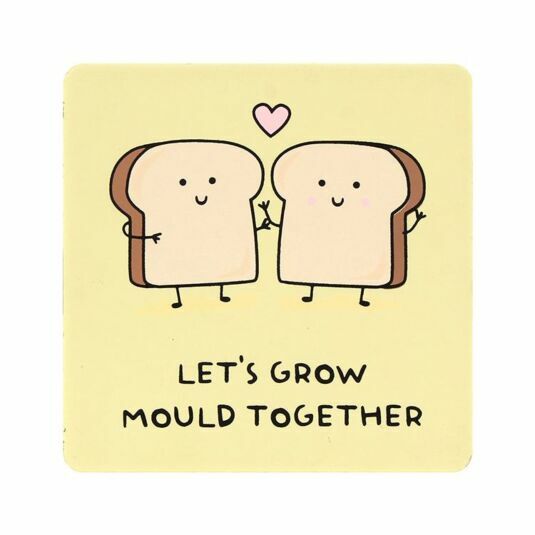 A love heart floats between the two and the words ‘LET’S GROW MOULD TOGETHER’ are underneath. 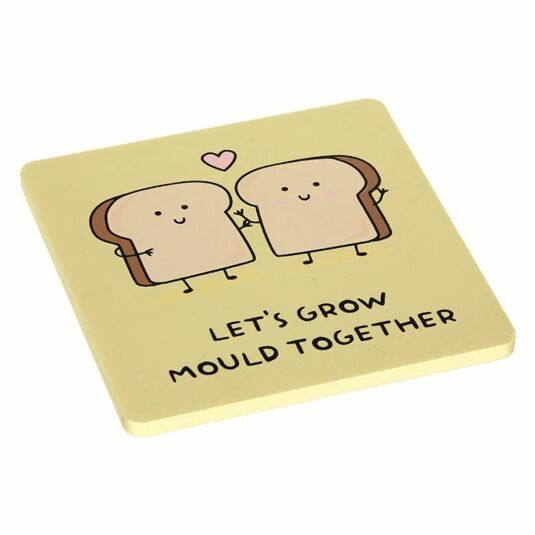 This would be ideal for those who like silly puns or want to show their love in an adorable way. A great gift for a friend or loved one, treat someone to something special and make them laugh! Great for siblings, students and friends, a lovely gift for birthdays and special occasions, why not collect them all!